Opened in 1909, the Queensboro Bridge is the longest bridge spanning the East River. 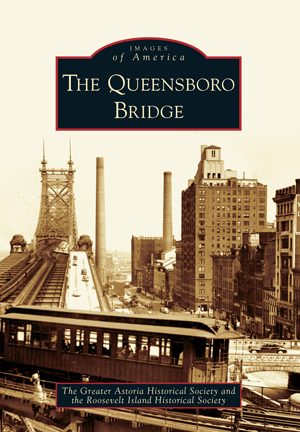 The bridge had an immediate and profound effect on the development of Queens from a largely rural area into a bedroom and working community. With its graceful symmetry, the bridge has long been a source of inspiration for artists, songwriters, and authors. Paul Simon and Art Garfunkel made it an icon for the 1960s with the song "The 59th Street Bridge Song (Feelin' Groovy)," and more recently it was featured in the movie Spiderman. Through historic photographs, The Queensboro Bridge documents the creation of this cultural icon and its contributions to the history of New York. The Greater Astoria Historical Society, author of Long Island City and The East River, is known for its vigorous efforts in community preservation, imaginative programming, and numerous articles on local history. The society joins its talents with the Roosevelt Island Historical Society for this project. The Roosevelt Island Historical Society, author of Roosevelt Island, was formed when the new community was developed in the 1970s. Its focus is the architectural, institutional, and genealogical history of the island. The society exhibits, publishes, and offers programs and tours to those seeking the island history.